Signed, numbered and slipcased. 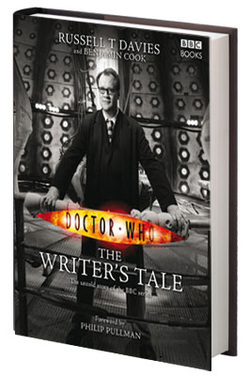 A unique look into the BBC's most popular family drama, Doctor Who: The Writer's Tale is a year in the life of the hit television series, as told by the show's Head Writer and Executive Producer. A candid and in-depth correspondence between Russell T Davies and journalist Benjamin Cook, the book explores in detail Russell's work on Series Four, revealing how he plans the series and works with the show's writers; where he gets his ideas for plot, character and scene; how actors are cast and other creative decisions are made; and how he juggles the demands of Doctor Who with the increasingly successful Torchwood and The Sarah Jane Adventures spin-offs. Russell's scripts are discussed as they develop, and Russell and Ben's wide-ranging discussions bring in experiences from previous series of Doctor Who as well as other shows Russell has written and created, including Queer As Folk, Bob and Rose, and The Second Coming. The reader is given total access to the show as it's created, and the writing is everything you would expect from Russell T Davies: warm, witty, insightful, and honest.Fully illustrated with never-before-seen photos and artwork - including original drawings by Russell himself - The Writer's Tale is a not only the ultimate Doctor Who book, but a celebration of great writing and great television.